Eerie Wanda released their new album, Hum, on February 26 via Beyond Beyond Is Beyond Records. Check out the track "There Aren't Many Things" from the album, below. Eerie Wanda began as the music project of Croatian/Dutch singer-songwriter Marina Tadic. After graduating art school in 2011 she joined the Amsterdam group Earth Mk. II on guitar. Finding inspiration in bands like The Velvet Underground, Young Marble Giants, Beat Happening & Daniel Johnston, Marina decided to try her hand at writing her own songs. After a collection of her bedroom demos began circulating among friends in the Amsterdam music scene they eventually made their way to veteran producer/bassist Jasper Verhulst (formerly of Lola Kite/Moss, currently in Jacco Gardner) who encouraged her to put a band together and record a proper album. After adding Bram Vervaet (formerly of Lola Kite) on lead guitar and Nic Niggebrugge (also currently in Jacco Gardner) on drums, tracking began for the debut Eerie Wanda album Hum in an old Cold War-era bunker in Vondelpark, Amsterdam. 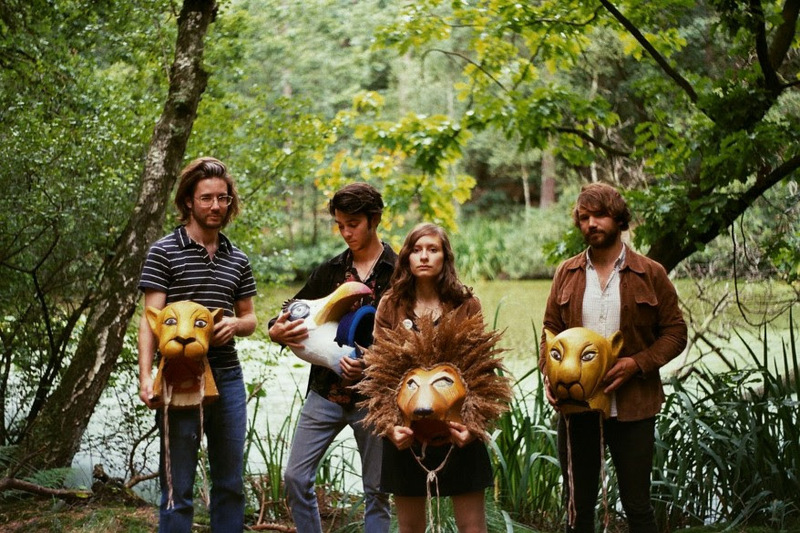 Their first live shows were met with much enthusiasm and a slot supporting L.A. band the Allah Las for several dates on a European tour was quickly secured. Eerie Wanda is marked by Marina’s sepia-toned songs, sung in a dreamy tenor and based around timeless melodies and arrangements. The songs stick to a classic formula, evoking a warm summery nostalgia and drawing comparisons to Angel Olsen, Broadcast, & the tuneful dynamics of Buddy Holly. Her voice is as central as anything else to the album’s success; it’s a two-toned, barely-accented gem of sweetness and melancholy, a distant cousin (somehow) to both Hope Sandoval and “I Am the Cosmos”-era Chris Bell. Tadic’s voice is compelling and consistent throughout the album, both sturdy and sympathetic, the ideal vehicle to carry the band’s often-ornate brocades of sound. Hum undoubtedly benefits from the musical contributions delivered by a positively note-perfect backing band, parts of which has provided similarly shimmering sound enhancement for Jacco Gardner. Here, the band plays almost indescribably well, as tight and together as anything you’re likely to hear this year. The title-track, in particular, boasts a “Wrecking Crew”-worthy accompaniment, with a walking bass-line and leisurely, graceful guitar giving the song a brightness unmatched.